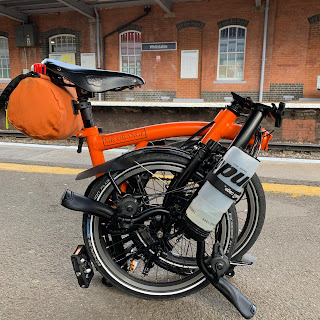 My Orange Brompton: Roman Baths in London on a Brompton! London is a very unusual place to say the least. You really never quite know what you are going to stumble across. The beauty of travelling on a Brompton is that interesting locations can be accessed within a short cycle ride. Today I was treated to an extraordinary sight that I had not know ever existed until very recently. Finding myself near Temple (I won't go in to the reasons why) I decided to try and find Strand Lane and a location that I had heard about a few weeks ago, with a rather integrating surprise awaiting those able to find it. A Roman Bath! The Lane itself is a rather dirty affair with rubbish bags festooned across the floor. It is not generally the type of place I would be seen dead in as it looked like mugger heaven. If you are brave enough to go to the end and look to the right, you will find a window with a light switch on the outside, yes the outside. I didn't need to use it as peering in through grimy glass, I could just make out a sunken Romanesque bath in the gloom. It really was a strange thing to see in the middle of London and stranger still is the way one views it. Apparently the jury is still out on the Roman credentials. It could indeed be Roman but no one is completely sure? Some say, it was at one time fed by a spring of water. There might be some truth in this as I am sure I remember hearing on one of those Halloween Ghost Walk sojourns, a stream once flowed from around here to the Thames itself. I could be wrong on that one though. I found out later on via an internet search that the site it actually run by the National Trust! Even more amazing is that you can contact them to arrange an appointment to see the interior!! I'm not sure I personally would go that far but it is well worth a visit and yet again, if I had left my Brompton at home I would probably have not seen it. So, if you are in central London and near this location, give it a go. It really was one of the most unexpected things I have seen in London. (The most unexpected thing, was two people wearing those golf sale signs having a fight on Oxford Street, whilst still wearing said signs).